Help Bring Star Realms to Steam! 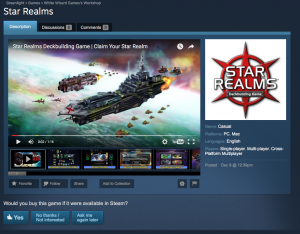 White Wizard Games is excited to announce the launch of our Steam Greenlight for the award-winning Star Realms digital deckbuilding card game. While many players exclusively play our game through their iOS or Android devices, we also have versions available for the Mac and PC. If you’ve purchased the game for any platform, your username and password will work for all four platforms, and plenty of users have done just that. Click here to vote for Star Realms! Many have asked us to add support for the Steam platform for desktop play, and we are finally able to support it. But only with your help! Steam Greenlight is a competitive process. Our game will only join the Steam platform if many of you go to the Star Realms Greenlight page and vote Yes for it. Since Star Realms supports cross-platform multiplayer, more users through Steam means more players to play against online any time, any day, in any format you choose. This is only possible with your help. For users of our desktop app, Star Realms on Steam will be a major bonus. We plan on supporting most aspects of the Steam platform, including letting users enable auto-updating of the desktop client much like our iOS and Android users can. Thank you so much for your help. Darwin, Rob, and the rest of White Wizard Games really appreciate your support in helping to bring Star Realms to an additional community of gamers. 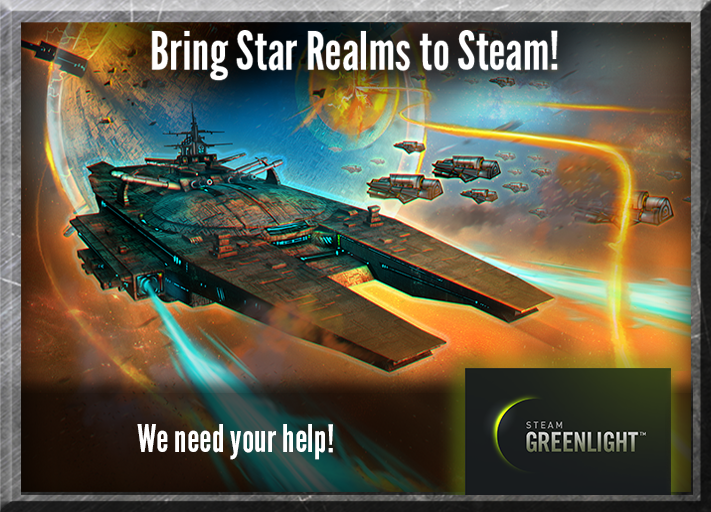 Once again, to vote for Star Realms on Steam Greenlight, please click here. Would existing accounts change? No. ALL of your DLC already works across all four platforms, and that will not change. Any purchase on one platform automatically applies to all platforms, including a future launch on Steam. Could you please also create a Linux version?